I was wondering if Dalmatian mollies grow larger than Black mollies?? 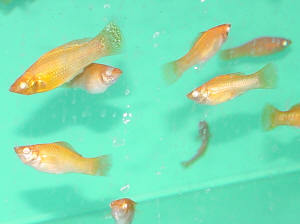 At the fish store I was at the Black Mollies were listed as growing up to 2 1/2 inches and 4 inches for the Dalmatians. Since it was a big box store I doubted their information, but maybe they were right. Are Dalmatians related to Sailfins which apparently grow to 6 inches? Also are female Black Mollies more peaceful than any other molly?? Thank You!! I was told that they were tattoo for they have purple on one & blue polka dots. Geez I think the Fish Bowl don't know squat about what they are selling. Are they okay with the rest? Thanks for the info & will tell people not to buy them. Not a problem here. But they are really playful & (I know its not true ) but rub against each other & the other fish leave them alone. I did buy a male swordtail he really beautiful but notice the female are getting aggressive. Anyway Neale I do know your busy & will try to leave ya alone & will spread the word about the tattoo thing. I 'm hoping that they use a paint brush to do that & not needles. name doesn't match the one you stated in your article.